The Broadway tour of Peter and the Starcatcher,* which recently landed at Hennepin Theatre Trust's Orpheum Theatre, is not your typical Broadway show. And that's why I love it. Not that I don't love typical Broadway shows, but Broadway is not usually the place to see innovations in theater and storytelling, especially lately with the increasing trend of turning every movie into a musical. Peter and the Starcatcher, despite being based on a book and a prequel to the well-know and much-adapted story of Peter Pan, is completely original and refreshingly innovative. Incorporating music (a few songs accompanied by keyboard and percussion, which also provide a soundtrack to the action), elements of physical theater (similar to Minnesota's Live Action Set and Transatlantic Love Affair), low-tech stage illusions, and good old-fashioned storytelling, it's a delightfully successful theatrical experiment. Peter and the Starcatcher is based on the 2004 novel Peter and the Starcatchers by Dave Barry and Ridley Pearson, a prequel to the Peter Pan story we're all familiar with. The play was written by Rick Elice and is directed by Roger Rees and Alex Timbers (who, along with several members of the creative team, was also responsible for the wacky and fun satire Bloody Bloody Andrew Jackson, which can be seen this summer in a production by Minneapolis Musical Theatre). Much of the story is explained to us in narration by the twelve-person ensemble. The title character is an unnamed and unloved orphan who's sold into slavery along with two other boys. They're being transported on the ship Neverland, captained by Slank and his rough and rowdy crew. Also on board are 13-year-old Molly and her nurse. Molly's father, the well-to-do and important Lord Aster, has entrusted her to the captain while he travels on a more dangerous route aboard the Wasp, on a mission for the queen. He's transporting a trunk of the mysterious "starstuff" that unbeknownst to him has been swapped with a similar trunk of worthless sand by the devious Captain Slank. Aster's ship is overtaken by pirates, namely the dastardly Black Stache, and much hijinks and hilarity ensue as the pirates try to get the treasure and Molly and the boys try to save it and her father. The action continues in the second act as they all land on a colorful tropical island. All of the trunk-swapping and devious machinations are a little convoluted and at times difficult to follow, but it's a sweet and engaging story with a heroine and a hero to root for. Through it all runs the theme of home and friendship and belonging, as the unnamed boy becomes the legend that is Peter Pan. This is a true ensemble piece; each member of the twelve-person cast has many roles to play and is fully committed to the storytelling. They form walls and doors, provide sound effects, and create a window or the waves of the ocean from a simple rope, a friendly bird from a rubber glove, and a bright fairy from a spot of light. In a crowd-pleasing scene to open Act Two, this mostly male cast dons costumes and sings about how "starstuff" turned them into mermaids. As Peter and Molly, Joey DeBettencourt and Megan Stern (the sole woman in the cast) are strong and charismatic, and Benjamin Schrader is a delight as Molly's nurse. Black Stache (aka Captain Hook) is a scene-stealing scenery-chewing kind of role (it won Christian Borle a Tony), and John Sanders is up to the task, stretching out every word and gesture to its most hilarious effect, culminating in a several minute long rant in which he repeats "oh my God" what seems like hundreds of times, conveying a range of emotions with just those three words. What I appreciate most about Peter and the Starcatcher is that it's a really creative and fresh form of storytelling. When children's entertainment is done well, and doesn't talk down to them and spoon feed them easily digestible morsels, but rather engages their brains and imaginations as participants in the storytelling experience, it's something that children of all ages, including the hated grown ups, can appreciate. Peter and Molly and the boys are only in Minneapolis through the weekend, so get there soon to experience another side of Broadway. 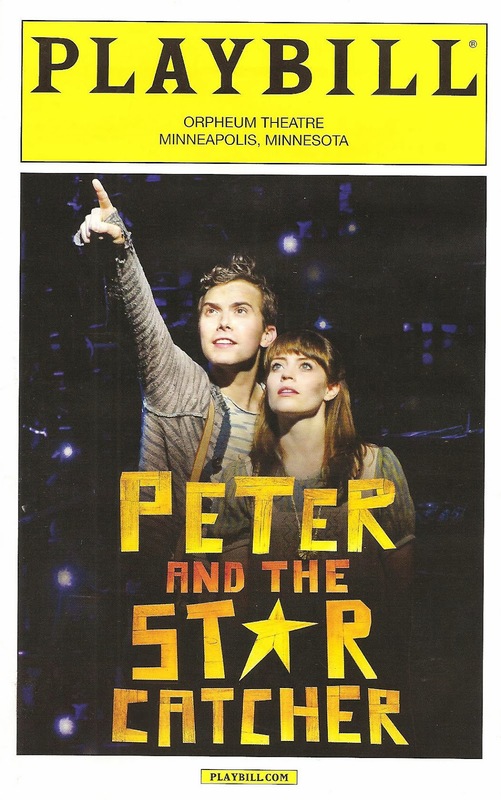 *I saw the Broadway production of Peter and the Starcatcher the last time I was in NYC, and borrowed much of this post from what I wrote then. I really loved this show for some of the same reasons you mentioned!